I woke on the morning of June 1st anxious to get going. I left Nicole and Erik’s with a car full of stuff and head off to my storage space. I thought that if I could get that stuff unloaded and clean out the rest by 2pm, I could meet my next house, Madame Pamita by 3pm. She had play rehearsal and the plan was to join her for that before heading back to her place for dinner, photos, and an interview. As mentioned in a one of my previous entries, that was not to be. Also, as I mentioned earlier, I was able to clean up and pack up one more carload of stuff before my storage space could hold no more. After battling traffic, I returned to my apartment to assess the situation. It was now approximately 2:30pm, and I texted to Pamita that I would not be arriving at 3pm. A new plan was set to meet her when she returned home, some time around 8pm. Again, as previously mentioned, even that would be a challenge. The cleaning and packing dragged on and 7pm was quickly approaching. If I was to make it there even by 9pm, I needed to wrap things up, take a shower, and get on the road. At this point I was drenched in sweat and dust, so a shower was necessary. In addition, I needed to pick up a some money from a friend. You see, my unemployment check had not arrived and without this loan, I would not be able to get by for the next few days. So, I looked around my place and quickly determined that everything would wait until Wednesday. I negotiated an additional day of rent with my landlord and arranged a time to meet him the next day. I loaded a box of Kirkland sized cleaning products and my bowling ball into my car. The cleaning products would be donated to my friend who was making the loan and the bowling ball would be stored at his place. He was already holding on to my guitars and as we had bowled together quite a bit in our younger years, it seemed appropriate that he hold on to it. I also grabbed a nice bottle of tequila that I had been saving for a special occasion that never arrived. That, along with a bottle of margarita mix, would go to my friend who had rented the truck for me and help me move the day before. I then gathered some somewhat clean clothes and hopped in the shower. Tick tock tick tock tick tock. At this point, Pamita notified that she was on her way home. I hadn’t left yet and was starting to feel bad. I had already missed my scheduled 3pm meeting with her and was going to be late for the revised schedule. This was not the way to get the project started and not the way to make a good first impression. So, I quickly finished getting ready, hopped in the car, dropped of my donations, picked up my loan and headed to Palms. Traffic had also not been cooperating with me over these days. Not that it ever does. But, as I had been pretty much a homebody for a while, I had forgotten about this. Well, this trip, was particularly trying. It seems that the traffic light on the on-ramp to the 10 freeway at La Brea was broken. It would stay red for what seemed like forever and then flash green for about a second. As you can imagine, traffic was backed up on the ramp and it was 8pm. The freeway was moving. There was no need for the light at all. I was about burst a blood vessel in my head, but managed to calm myself down and deal with it. After that bit of stress, the traffic on the freeway carried me along to my exit and then to my destination. I managed to find one of the last non-permit, non-street sweeping parking spots near Pamita’s place. I grabbed my laptop bag, my clothes bag, and my camera box and shuffled around the block to meet my new friend. She was waiting outside to assist me. It was a welcome sight. I was glad to finally be there and forget about my stuff and my apartment for a little while. We discussed the days events and she popped open a bottle of wine and threw a Trader Joe’s pizza in the oven. She was very understanding of my stressful situation and offered me calm place to relax for the evening. She showed me the Holga that she recently got, as well as her father’s Yaschica-mat, and some tintypes of herself that were done by a photographer out of the San Diego area.. I don’t have photos of the Yaschica or tintypes, so a follow-up visit may be in order. We discussed the project and I told her how I thought it would be a bit easier for me as I had spent a month in New York each of the past two years. While I was in the same place nearly every night, I was living out of a suitcase. This led to further New York stories and after about an hour of this, we realized it was it was getting late and we hadn’t even started taking photos or conducting my interview. 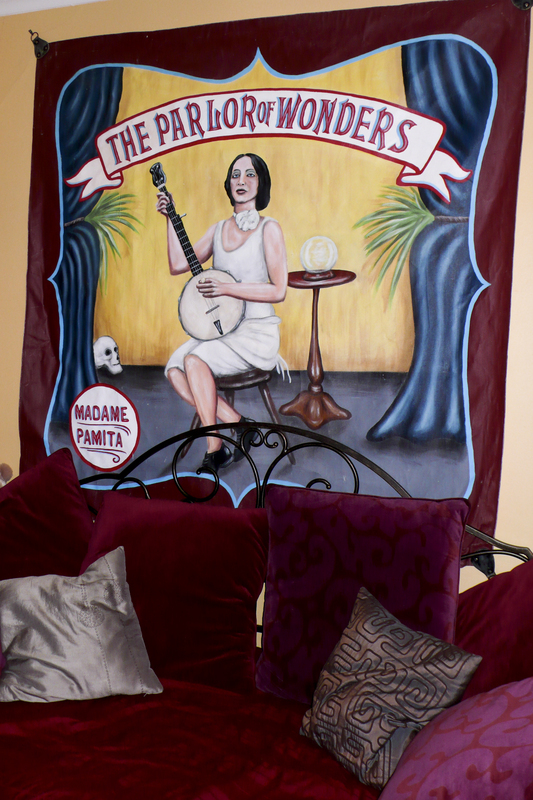 So, Pamita quickly transformed herself into Madame Pamita and we got down to business. This interview went fairly well. As it was my second, I was still tripping over some questions and repeating myself unnecessarily, but it everything was asked and all the photos were taken, I think. She then returned to being Pamita and escaped to the comfort of her boyfriend’s apartment leaving me to upload photos and sleep in peace. It was a welcome quiet. I slept fairly well, but awoke early anxious to finally finish cleaning out my apartment. As well, her building was being painted, and painters like to start work pretty early. After leisurely getting myself together and gathering my things, I headed out for what would hopefully be my final adventure at my old apartment. I was looking forward to finally finishing that portion of my life and seeing what the future would hold. OH no no no no no! GURRRRRRRRRRRRRRL! (Gurl assumes the masculine when you roll the r’s) You will NOT be trying to make yourself useful in my apartment using…(*gag*) Kirkland sized cleaning products. I have a maid thank you. And she has been schooled to use method brand kitchen cleaners, Crabtree and Evelyn tub and shower exfoliants and only lavender water on my linens with a thread-count of one thousand. You will NOT be bringing any Costco closeouts, no good 99cent store overstock or be eating any government cheese while you are staying on my Halston approved ultrasuede couch. J-Lo brought some chex mix to my Christmas Party and she might be Jenny from the block but not this block. She’s been blocked. I’m having a vision of the future to come… The return of Evil Dean. I love how you told your story. You are working hard man.